Despite being marketed and sold as a luxury vehicle, the Lincoln Navigator packs the same 450 horsepower, 3.5L EcoBoost V6 that powers the F-150 Raptor and packs quite the punch. Lincoln naturally puts emphasis on luxury in their campaigns for the new Navigator, but with an athletic EcoBoost V6 engine under the hood, Lincoln is selling what we can only describe as a wolf in sheep’s clothing. If 450-horsepower isn’t enough to qualify the new Lincoln Navigator as a sleeper, Hennessey Performance will up the ante with their “HPE600” tuning package for 2018-19 models, bumping the output by 150 horsepower, for a total of 600 horsepower. But how much of a difference will that make? Hennessey has answered that question for us with a drag race. Hennessey recorded a drag race between a bone-stock Lincoln Navigator and a Navigator with their HPE600 package at the Pennzoil Proving Grounds to see how big of an advantage 150 ponies gives to a full-size family hauler. Spoiler alert, the upgraded Navigator wins. But you probably already knew that was coming. Watch and see the way that the HPE600 Lincoln Navigator digs in, launches, and never looks back at its stock sibling. So the 3.5-liter V6 doesn’t sound the best, and we’d much rather hear a V8 rumble under the hood, but we love the performance enough to forgive that minor detail. AMG G-Wagon and Range Rover SVR owners should watch their backs, and mirrors. 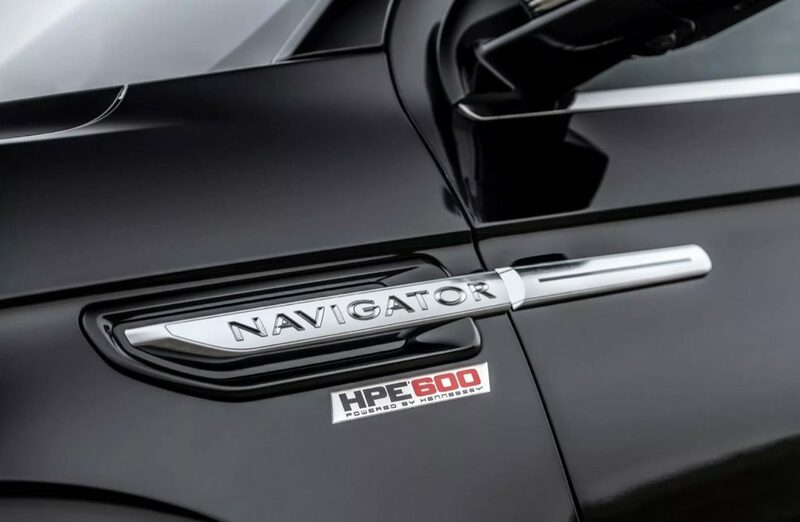 Americans are loving the new Navigator, and with the HPE600 package from Hennessey, owners will be able to out-luxury the foreign competition, and smoke ’em on a drag strip. Subscribe to Ford Authority for more Lincoln Navigator news delivered directly to your inbox. I wonder how many 0-60 runs it takes before the Hennessey tune burns a hole in a piston? I don’t believe many Navigator owners will have their SUV’s modified by Hennessey since it will void the factory warranty, Hennessy’s warranty will not match the factory warranty and there is no mention of price (it definitely won’t be cheap).